In a Jaguar from a cruise ship or Glasgow. TOUR GUIDE RESPONSE: Thanks Don. Very kind of you to post your review. I am delighted that you enjoyed the tour. We had such a fun day with Bill R. in Scotland! He took us to a quaint little town called Luss. He took my husbands health issues in consideration when choosing where to go. He gave us so much background and answered all our questions. Bill is so friendly and kind and if we ever make it back to Scotland I hope we can see Bill again! Bill gave us a memorable and beautiful day's visit to Inverary Castle and the Highlands of Scotland, including a nice visit to the quaint town of Luss and the ancient church and loch there. The castle and grounds/gardens were beautiful at Inverary Castle and the town itself located next to another beautiful loch. He picked us up promptly at our cruise ship terminal in Greenock and we had a beautiful and not-soon-forgotten visit to Scottish Highlands. Even the weather cooperated! TOUR GUIDE RESPONSE: Thank you for your kind words. We had a wonderful time on our tour today, Bill! So much better than a bus would have been. Beautiful day. Enjoyed meeting local people in Luss. Thanks for showing us a good time. Your great sense of humor made it even more enjoyable! TOUR GUIDE RESPONSE: I really appreciate your review. I am so glad you enjoyed the tour. We have completed a 13 day cruise with approximately 10 land tours. Bill's was one of the most memorable. It was definitely the most comfortable. We felt like he was an old friend picking us up at the port and showing us his home town. Bill was the best part of the tour. He was knowledgeable, delightful, funny, intelligent and a good driver. We also loved his co Jaguar. TOUR GUIDE RESPONSE: Thank you Matt & Christine for the great review. It really was kind of you to write it. I have written to you via the email system. TOUR GUIDE RESPONSE: Thank you Judy so much. I have replied privately to you through the Tours by Locals email system. My tour with Bill left me feeling relaxed because I was in the care of a professional that knows his stuff. At the same time I could enjoy individual conversation, asking lots of questions without being herded onto a massive bus with no time. He seems to know lots of folks, or at least becomes fast friends, and gets the lay of the land quickly so that he can make things happen for his guests. The day was a true joy and I'd recommend him to any and all! TOUR GUIDE RESPONSE: Thank you Peggy. I am so pleased you enjoyed the tour. I have written to you privately. This was a fantastic trip with a lovely man with a great sense of humor. we went to the loveliest of a town 120 people and spent a good deal of time mingling with people and enjoying this gem. We, as always, spent a good deal of time learning about the country, socioeconomic conditions, health care, universities. We did not regret our decision to skip the city and journey though the countryside. We wish we had had more time with this terrific gentleman. TOUR GUIDE RESPONSE: Hi Audrey and David Thank you for your review. I am so glad it went well and the weather was kind. This was a wonderful tour and Bill was awesome!! We were a little under the weather and the weather wasn't great either! Bill on the other hand was great! Very knowledgeable, friendly, and although we weren't feeling well he made this trip so enjoyable!! TOUR GUIDE RESPONSE: Thank you for your review. The weather was dreadful and you both took it in your stride. Bill was very fun and personable. This was both a driving tour and walking tour. We drove around the outskirts of Glasgow and visited the Riverside Transportation Museum that was wonderful. We then went to the city center to visit many sights which included a ride on the subway. This is a very beautiful and historic city. The Beautiful Jaguar automobile was nice but this tour should really be for 3 or less people. The 4th person sits in an awkward position straddling the console. TOUR GUIDE RESPONSE: Thank you for the glowing review. I really appreciate it. I agree with you that 3 in the back of the car is not ideal. Always better with 2. The Jaguar is a huge car and very very safe. Enjoy the rest of your cruise. This tour was spectacular. I have wanted to see the Scottish countryside for years and was not disappointed. Bill is very well informed about the area and was so accomodating. The vehicle was very comfortable. Plenty of room for 4 guests. Bill has a good sense of humour and we enjoyed his jokes and his lovely singing!! TOUR GUIDE RESPONSE: Please do come back again and see some more further north. Glad you liked The Blythswood Hotel as a base. Best hotel in Glasgow with the Highlands only a short drive away. Thank you for your kind words and a fab 5 stars. Also pleased you liked my big Jaguar "The Duchess". We had a lovely tour of Glasgow. Although we only had a half day available, Bill showed us all of the highlights and we got a good feeling of the culture and what the city was all about. We had a lovely time. TOUR GUIDE RESPONSE: Thank you Ann. Tried to get as much in as possible. So glad everyone had a good time. TOUR GUIDE RESPONSE: Thank you so much Leslie. I have written to you privately. Bill was a terrific tour guide for the day! The private tour was everything we had hoped for and more. I loved how he kept our 14 year old son entertained and was flexible, accommodating and fun to spend the day with. I highly recommend spending a private day trip with Bill. I know you won't be sorry you did. The pick up and drop off at the cruise port was super easy and I would book again with Bill if ever we get the chance to return to Glasgow. The tour was wonderful and Bill was amazing. He was very knowledgable and made the tour fun. TOUR GUIDE RESPONSE: Thank you so much for your comments. I hope you enjoy The Harry Potter train and The Island of Skye. Bill was awesome. Just a great tour. He maximized our time and we saw way more than anyone else would have been able to show me. No way you can do better. 5 billion stars. TOUR GUIDE RESPONSE: Thank you Bryan. That is some score. It was great to meet you. Bill was a fabulous tour guide! He is genuine, has great stories, and really knows the history and geography of the tours he provides. We were lucky to find him. 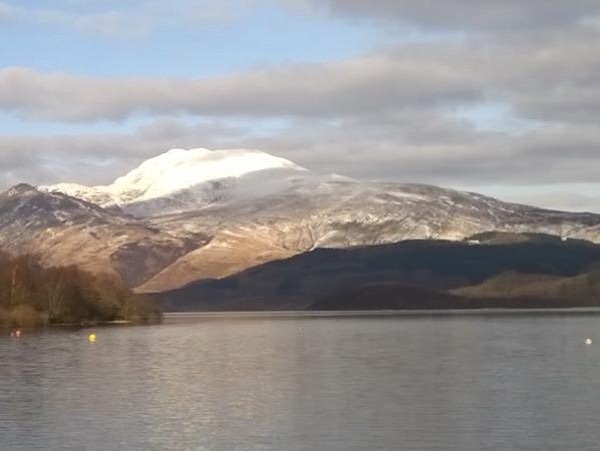 The custom tour of Loch Lomond and the lovely village of Luss were exactly what we were looking for. It was a magical day discovering our family roots in Scotland that we won't soon forget! Thanks Bill! TOUR GUIDE RESPONSE: Thank you Marjorie! It was a perfect day. The sun shone and you met your clan chief. What fun we had! Bill was friendly, flexible, and well informed. He rolled with our differing interests, suggesting appropriate locations to explore which added new dimensions to our understanding of the history and features of Glasgow. TOUR GUIDE RESPONSE: Thank you for your kind comments. It was great to meet you both. I really enjoyed your company. I do hope you enjoyed the rest of your vacation. Had an absolutely wonderful day with Bill who customized the day for us so we could see where family members lived in the 1800's. Bill made the day educational and very enjoyable by showing us the beautify of the area, Loch Lomand, Luss and the West End of Glasgow. The day was perfect! TOUR GUIDE RESPONSE: Thank you Blair for your kind comments. I am so pleased you enjoyed the day so much. Bill is a fountain of information and the day with him was excellent indeed. He is witty, flexible and so proud to show off his city. The spur of the moment plan to listen to an organ concert at an art museum was fantastic. Five star tour and a 5 star guide. A day with Bill opened our eyes to the beauty of the countryside along with the joy of Glasgow.We appreciated his knowledge of Scottish history and his tid bits of Scottish lore..We would recommend him to any potential user of Tours by Locals..You will have a wonderful and memorable time. TOUR GUIDE RESPONSE: Thank you so much Robert. I really appreciate your kind comments. TOUR GUIDE RESPONSE: Thank you so much Cas. It was a great day! Bill gave us great insight to the history and culture of Scotland. TOUR GUIDE RESPONSE: Thanks Ken. It was a great day. TOUR GUIDE RESPONSE: Thanks Neal for the 5 stars. Bill was an excellent guide with an enthusiasm for his city and was a mine of information. We covered many sights in the short time we had with his wonderful motor and explored some of the less "tourist" areas. A good day despite the rain. TOUR GUIDE RESPONSE: You are so right! The Scottish weather was dreadful. Torrential rain! Traffic was awful. Tried to make the best of it in the short time available. What a shame! Thanks for your kind comments. Bill was wonderful. He is friendly, has a good sense of humor, and is very accommodating. We enjoyed his tour very much. We spent an absolutely wonderful day with Bill. He is very entertaining and user friendly! We started with a visit to Luss which did not disappoint, took a tour of Inverary Castle and gardens, ate a delicious lunch at the Castle, made a stop at the George Hotel pub, with plenty of wonderful sightseeing and stops along the way. Bill is very knowledgeable and easy going. GREAT tour! TOUR GUIDE RESPONSE: Thank you for your kind words. I really enjoyed your company. Bill was a wonderful guide! We communicated before the tour date, so he could get an idea of how we most wanted to use our time together, and made certain we saw all that we wanted to see and got a lovely sense of the city and it's history. We had a delightful day, and would definitely recommend Bill to anyone visiting Glasgow! Our full day tour with Bill could not have been more perfect! Bill was excellent in communicating with us well prior and up to the day of the tour. It was so helpful. Bill is very professional, very well prepared, highly knowledgeable, so humorous and very personable. We learned so much about the history, architecture, people, and cultural aspects of the city and beyond! There was never a dull moment with Bill. We would love many more tours with Bill. We are so grateful to him for sharing so much! TOUR GUIDE RESPONSE: Well you know it works both ways! I loved being in your company. You are two of the nicest people I have ever met. I do hope we meet again and I have a feeling we will. Thanks for your review of the tour.Have a safe journey home. This was a fabulous tour and could not imagine a more perfect guide than Bill. He was informative, entertaining and thoughtful. We would love to have him along for the remainder of our vacation. Great guy and fun to travel with. Bill was pleasant and considerate of his passengers. His Jag was smaller than my super V8 Jag so it was a bit tight for 3 normal sized people in the back seat as it is in mine also. He took us where we wanted to go and we enjoyed the area and his company. TOUR GUIDE RESPONSE: Thank you for your comments. I am surprised about your comments regarding the Jaguar XJ6 as it is considered a huge car here in the UK. I do accept that the car is more comfortable with two people in the back rather than three -- but this applies to any vehicle. The car is very safe and that is why I chose it. I am pleased you had a good day and I know that you all enjoyed the experience of Inverary Caste. It is just a magical place. We had a wonderful experience with Bill. He was a joy to be with and he showed us so many wonderful places. We would definitely rate him a 5 out of 5. We loved our time in Glascow. TOUR GUIDE RESPONSE: Thank you for your kind words. I really enjoyed touring with you all. Everything went really well and the weather was glorious. I do hope you all come back again and we can go to the very top of Scotland. Haste ye back. My husband and I have used Tours By Locals many times and we highly recommend Bill. He was very interesting and knowledgeable. We were able to see many sites even though the weather did not cooperate. TOUR GUIDE RESPONSE: Thank you Aileen. I really appreciate your private comments. Very frustrating re the weather but I think we all managed to laugh and that certainly helps a great deal. Thorough and knew his history. Good personality and flexible to meet individual needs. TOUR GUIDE RESPONSE: Thank you both for your comments. I really appreciate your review. I am glad you had a good time. Bill was a wonderful guide through the Scottish Highlands and Loch Lomond. He was very informative about the history of the area. TOUR GUIDE RESPONSE: Thank you both so much for your kind words. I am delighted that you chose me once again for your travel plans. It was a great day out and the weather was fantastic. I hope to see you both again. My wife and I have traveled alot and have seen many different countries and have met many different guides. Greenock, Scotland is our favorite and Bill is hands down the best guide we have ever had the priviledge of meeting. His knowledge of Scotland was amazing and his character and charm are of equal value. It was our honor to be with him touring his native land. I wold highly reccommend him to anyone thinking about a guide for Greenock. Thank you Bill for a wonderful time!! Bill in one word to describe his tour of Glasgow and Loch Lomond is AMAZING! He took us all over his wonderful city and beyond. He was very knowledgeable as a life long Glaswegian and really understood what we wanted in a full day's experience. His car is very comfortable to ride in and we definitely saw parts of Scotland we would've otherwise missed had it not been for his expertise. He's very personable as well. If you really want to experience Glasgow look no further than Bill. Thanks Bill! Knew his stuff and was very affable. TOUR GUIDE RESPONSE: Thank you very much for your response. You are most kind. Bill is an excellent guide who took us to Lock Lomond and Glasgow. He has a beautiful Jaguar which drives like a dream. I sat in the front seat and my wife was in the rear seat. She had a bit of a hard time hearing some of the dialogue from the rear seat. Bill has an excellent fund of knowledge and a very easy-going manner. The tour covers a lot of ground and if you would like time to shop you need to tell Bill ahead of time to include that in his plans for you. We had a wonderful day on this tour. Our cruise ship docked in Greenock and Bill (tourguide) met us right at the Pier. He is easygoing and friendly with lots of interesting and fun stories to tell about the local area. This is a beautiful place with lots of picture taking opportunities, perfect for a private tour. Bill even took us to a local golf course (our request), which we enjoyed very much. He made us feel like we were hanging out with an old friend. Would highly recommend. TOUR GUIDE RESPONSE: Thank you so much for taking time to give this lovely review. I am so glad you all enjoyed yourselves so much. You were all such good company. Sometimes on these tours it is the unexpected that takes you by surprise and The Carrick Golf Club was one of those surprises wasn't it? I told my grandchildren about the nice folks from Texas --- and they looked surprised and hoped that you would TEXT US! When I told them it was a place where people live they had a hard time believing me. "Haste ye Back". Tour guide was friendly, helpful, informative, flexible, knowledgeable, had good sense of humour,interesting and an excellent driver. His car was very comfortable, but more suited to only 3 passengers with only 2 in back. Email communication before our trip was excellent with driver/guide, except that a booking form which had his mobile phone number on it was not received by me (and I've checked emails.) Lack of this number was a small problem at one stage. TOURSBYLOCALS RESPONSE: Hi Meredith, Your guide Bill's cell phone number could be found on your booking confirmation, in your ToursByLocals account. But we agree that having it accessible via email is a better solution. In the months since you booked your tour, we made this change, and now travelers receive their guide's cell phone via an email message. Thanks for your feedback! Bill was a delight to spend a day with in his native Glasgow. We quickly felt as though a friend were showing us his favorite places with amusing anecdotes thrown in for good measure. We saw everything we had hoped to and learned lots about Glasgow in the process. Bill and Keith were wonderful! They managed to balance the customary sites with places of special interest to our group and even fit in some shopping while our men were occupied happily. They were very flexible and responsive to our wishes. We saw several sites (Victorian school and two beautiful parks - even a wedding in progress!) that I had not even heard of on a previous trip to Glascow. It was like being out for the day with old friends! Great tour, we saw a lot in the short period we were with Bill. bill is very professional and I will recommend him to others when they visit Scotland. Four of us spent a wonderful day with Bill in Glasgow. We loved that he was waiting for us when we disembarked from our cruise ship and dropped us off at the port at the end of the day. Bill took us to places that we never would have found on our own and shared stories about life in Glasgow, along with a history lesson. Bill made sure that we could see as much as time permitted. We would highly recommend spending a day with this fine, entertaining and knowledgeable gentleman. Thanks Bill. Bill's tour of Paisley was an absolute delight, delivering the best day of our Scotland journey. On learning of our interests he skillfully amended our itinerary to include places of great interest to us. Knowledgeable and thoughtful, he was especially kind in making the travel easy for my disabled mother. He arranged an opening of the Sma' Shot cottages on a usual closing day which was most appreciated. We highly recommend Bill's excellent services! We could not have done better in Glasgow. Bill did a good job of getting us to all the stops we were scheduled to go see. He got us out in front of most of the tour busses and into the major points of interest. The drive was pleasant and comfortable. He had plenty of knowledge of the area and was able to give us most of the historical information we were looking for. Thanks, Bill!!!!! TOUR GUIDE RESPONSE: Thank you so much for the positive review Greg. I am so glad you enjoyed the tour. TOUR GUIDE RESPONSE: Thank you for your kind words. It was an absolute pleasure to meet you all. Your company and responses to my city were so rewarding. I was sorry when the tour ended. Bill was very accomodating and pleasant. We thoroughly enjoyed our tour. TOUR GUIDE RESPONSE: Thank you so much for your kind comments. Bill made our tour of Glasgow a day to remember. It was the highlight of our trip. We can't rave about him enough. He was so knowledgeable and made us feel that we had known each other for ages. We hope to get back to this area and Bill would be the first person we would contact. We feel very fortunate to have found a new friend in Bill. Our tour to Millport on the Great Cumbrae Island...delightful communities that are away from the crowds and portray Scotland in its best possible light. Bill provided the best of tours, relaxing and scenic, touring in the comfort of his mint condition Jaguar and provided many photo stops as lunch and ice cream breaks with opportunities to mix with the natives. We look forward to touring with Bill again both to these delightful locals and to new ones! TOUR GUIDE RESPONSE: Thanks Warren. As you know this is one of my favourite places and with your great comments perhaps travelers will give it a try as an alternative tour. I think the main point is that it is not far from the ship in Greenock and it certainly does allow travelers the opportunity to meet Scottish people with their families whilst on holiday. Millport is in a time warp and long may it stay that way with all its gorgeous views and of course the purple heather. Lets hope lots of people book for next year. Bill was an excellent tour guide. Very knowledgeable and informative. We had a fabulous day with him. What a delightful day we spent with Bill. Our tour was unavoidably abbreviated by our ship's short call (on short notice) in port but Bill accommodated the change with aplomb and good cheer. He showed us Glasgow from on high and from street-level, from an artistic and historic perspective, as well as a personal one. Thanks again! Bill is one of the best guides we have ever had. He was knowledgeable about all that we saw and did. We had a great time with him as he is a fun person to be around. I would highly recommend him to anyone. If we come back that way in the future, I will definitely ask for him again. Bill's custom tour proposal for a delightful excursion to my grandfather's birthplace & the elegant Drumlanrig Castle in the Scottish Lowlands was perfect. On the way, Bill added a perfectly unexpected & appreciated short tour of downtown Glasgow & a surprise mountain stop to sample the clean, crystal water of a Scottish waterfall. Bill carefully worked our schedule so that we would return to our ship with ample time before departure. Thanks, Bill, for a wonderful day with you in your beautiful Scotland! Bill was friendly and fun. Ours was a custom family history oriented tour, so he had to personalize it rather than rely on standard tourist fare. Even before we arrived he had emailed helpful advice and photos. He was on time and his car was immaculate and comfortable. The day exceeded our expectations and we would not hesitate to recommend Bill and Tours by Locals to our friends. Driving on our own we would have wasted valuable time being lost, parking, etc. so the tour was well worth the fee. TOUR GUIDE RESPONSE: Thank you so much for your kind comments. It is much appreciated by me. I am delighted you had such a good day. What a day! From the moment we began exchanging emails I knew Bill would come through for me and he exceeded every expectation 10 fold. This was hugely important day for me and my family back home in Sydney as I was visiting my grandmother's childhood home, who at 95 yrs old, cannot make the trip herself. Bill quickly understood the importance of the day and had done his homework. It was a moving and emotional day; all of which Bill took in his stride. Thank you Bill, from the bottom of our hearts.